We developed the Project Home Life program in 2009 to help puppy mill survivors transition from life in a kennel to life in a normal home. Now we have the opportunity to help even more of these dogs, and together, with your support, we can make an even bigger difference! Pictured during the start of PHL in 2009 is Heather Hatt, Director of PHL with 2 PHL students! More and more dogs are arriving at Golden Gateway from puppy mills and farm/backyard breeders. While that’s good news, it has put a strain on our resources. 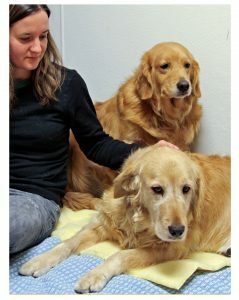 The Lynne Glennon Sanctuary for Senior Goldens and Puppy Mill Survivors is running at full capacity, and dogs that would benefit from Project Home Life (PHL) remain in the main kennel. We have developed a building expansion plan that allows us to create more space for group living arrangements and the PHL program. Such living arrangements have proven to be very effective in helping socialize these dogs, improving their adoptability, and placing them into loving homes sooner. This expansion will also increase volunteer opportunities to work directly with dogs. Expanding on-site, as opposed to using foster homes, allows for consistent training and oversight — so important to these dogs! Additional space will also improve the area for adoption meetings and replace the office trailer and storage sheds, all of which are deteriorating beyond repair. Please help us enable even more puppy mill survivors to have the chance to live the life every dog should! Your donation to this important expansion will make a world of difference, and every dollar counts. For questions about donating and naming opportunities, please contact Karen Whittaker. Metrics proof that our nationally recognized PHL program works. Adoption success increases as dogs are more prepared for home living, having acclimated to typical household sights and sounds. Far fewer are returned for failing to adjust, and their length of stay with us is much shorter — 48 days vs. 9 months. In 2018, we saw a 48% increase in the number of dogs rescued from puppy mills. By expanding our space, we can help greater numbers of puppy mill dogs not only survive… but thrive! Your generous donation will help these very special dogs. Please donate today. Learn more about our PHL program, expansion and DVGRR by watching our 2019 Golden Gala video and donate today to make a difference!